Anjem Choudary is a dangerous entity within the UK... But, not formidable... as Glen Saffer demonstrated. Stand up and be counted! 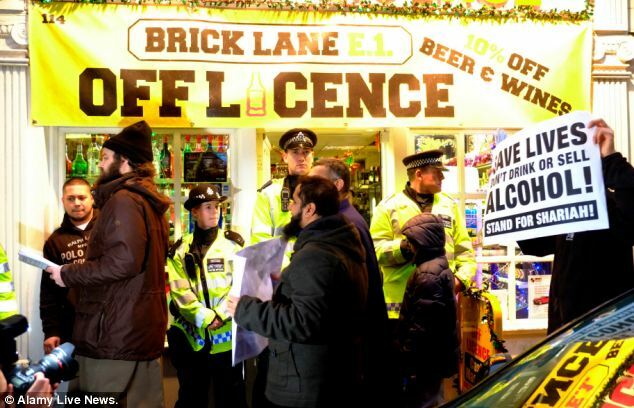 Dozens of Muslim protestors gathered to demand that businesses stop selling alcohol in a popular East London area yesterday. (They also wanted gambling halted). 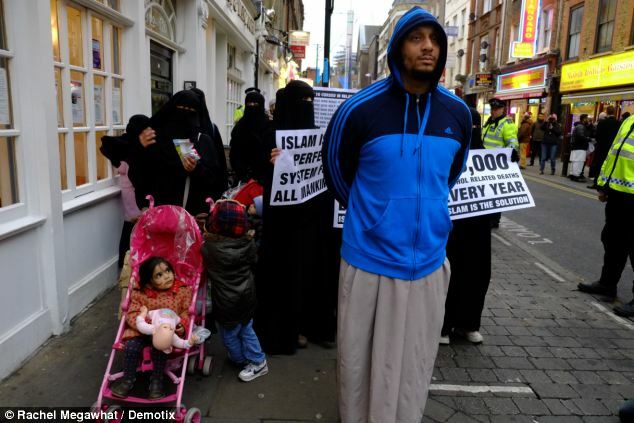 The group, led by former Al-Muhajiroun leader Anjem Choudary, warned restaurants and shops in the Brick Lane area that they face 40 lashes if they continue to sell the product, which is banned under Sharia Law. 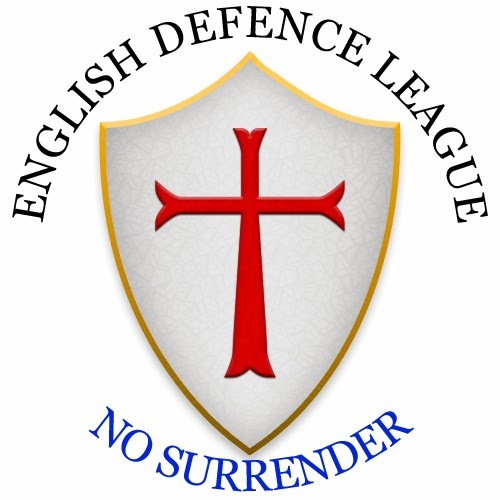 Around 60 men and women in burkhas handed over warning letters to Muslim-owned businesses in the area after the protest was initially delayed by a small number of English Defence League members staging a counter-protest. Controversial cleric Choudary was at the forefront of the protest. The Al-Muhajiroun group he formerly led has been banned under terrorism laws. Organisers told The Times the protest was held yesterday to coincide with the large number of office workers who would be in the area for Christmas parties. 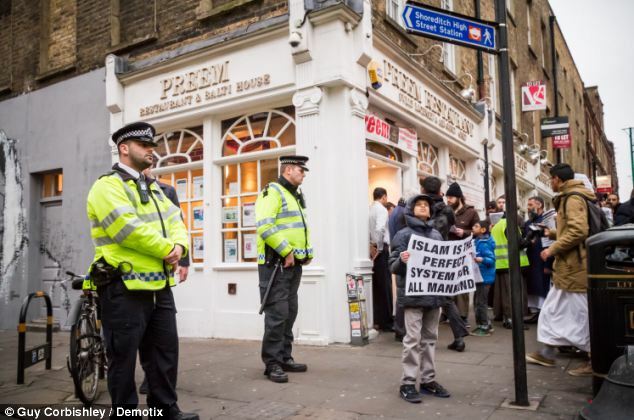 Choudary told the crowd: ‘The shops are run by Muslims and they know they are selling alcohol and they know the sale and consumption of alcohol is completely prohibited. He told those gathered it was his wish that Sharia law, banning alcohol, should be enforced in Britain. He also defended three ‘fantastic’ men who were jailed last week for attacking drinkers while on a ‘Muslim patrol’. He was referring to an incident in which Jordan Horner and another Islamic extremist told a couple they could not hold hands while walking down the street, because it was in a 'Muslim area'. Horner, 19, Ricardo MacFarlane, 36, and a 23-year-old man who cannot be named for legal reasons were sentenced to 68 weeks, 12 months and 24 weeks in prison respectively. Groups associated with Choudary were last month labelled the ‘single biggest gateway to terrorism in recent British history’. The radical Islamist has been identified as the link between groups who encourage the safe passage of British and European Muslims into Syria where they join Al Qaeda-linked forces. According to a study by Hope Not Hate, organisations affiliated with Choudary have encouraged in the region of 80 young British Muslims to join the fighting in Syria. They may also have had a hand in the recruitment of 300 more on the continent, the report said. As well as highlighting Choudary role in encouraging young Muslims to fight in Syria, the report also established a connection between the preacher's al-Muhajiroun network and high profile terrorists, including those responsible for the 7/7 London bombings. The report recommended that Mr Choudary should be considered a 'serious player' in the promotion and recruitment of young Muslims to terrorist cells. Sharia Law is derived from the Koran, the example of the prophet, Muhammad, and fatwas – or the rulings of Islamic scholars. It informs every aspect of the life of a Muslim, going far beyond the power of Western laws. The laws tell Muslims how to lead every aspect of their lives according to God’s rules. As well as banning alcohol, Sharia Law also outlaws meat which is not prepared in the appropriate way. A complex legal system, it clashes with British law in several respects. For instance, Sharia Law and British law have differing definitions of what constitutes marriage and how it can be ended.